Southeast of the Bahamas, lies a paradise of endless turquoise water speckled with coral islands. Dramatic walls, shipwrecks and a seasonal migration of humpback whales have lured resort divers here for decades. But who wants to spend their holiday in a hotel room? 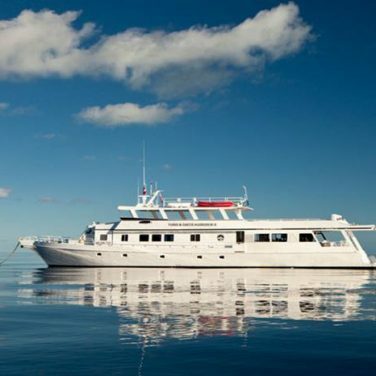 A Turks and Caicos liveaboard will help you make the most of your time in this dream diving destination. Home to some of the Caribbean’s most pristine and seldom visited dive sites, the islands of Turks and Caicos are also unique in their topography. A deep abyssal channel known as the Columbus Passage splits the region in two, creating an underwater highway for large pelagics like rays, sharks, turtles and whales. This largely unexplored final frontier of Caribbean diving is also home to a stunning variety of coral and fish. 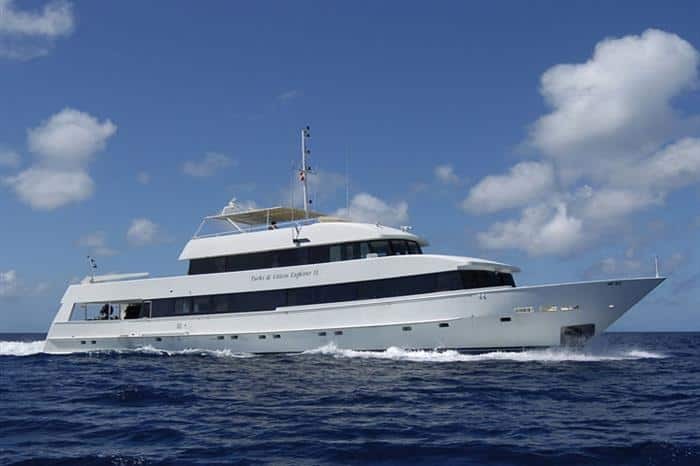 Both modern and luxurious, this 125-foot yacht offers serious divers a chance to take the plunge in style. Up to five dives per day can be completed from the Explorer’s zodiacs, helping maximize your time underwater. 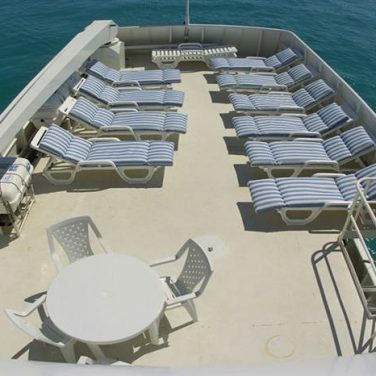 Between dives, guests can relax in spacious and air conditioned cabins or lounge around on the shaded deck. Other perks on board include hot water showers, camera and battery charging stations, and a roomy lounge. Made to order meals complete the upscale experience. 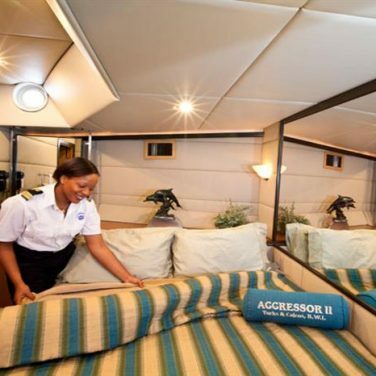 The Aggressor fleet is known for luxury liveaboards, and this boat is no exception. 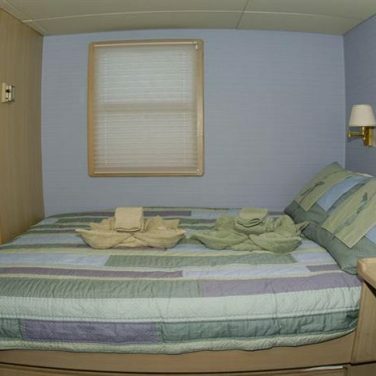 A hot tub, free beer and wine, chef prepared cuisine and oversized staterooms come standard. For those who can’t live without technology, satellite phone and internet are available. You can expect four to five dives per day from the 121-foot mothership, fish ID sessions and small groups underwater. 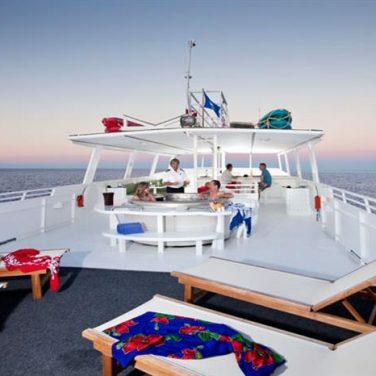 Back on board, a spacious dive deck and state of the art equipment facilities ensure a comfortable experience from start to finish. Turks and Caicos is an excellent dive destination year-round thanks to minimal variation in its beautiful weather and water conditions. The sun shines approximately 350 days out of the year, and air temperature hardly wavers from its average 85-90°F. You can expect fresh and breezy evenings and relatively low humidity, thanks to the Caribbean trade winds. Divers will find warm water throughout the year, with summer highs of 82-84°F and winter lows at 74-78°F. Visibility is good with 80 or more feet on a typical day. Hurricane season, which runs from June through October rarely affects the islands. But, you should plan for a potential storm and watch the weather if you are visiting during these months. The National Hurricane Center is your best resource for tracking weather in the region. Every year, between January and April the waters around Turks and Caicos transform into a haven for humpback whales. Gathered in a small area known as the Silver Bank, the whales will spend their winter courting, mating, and rearing calves. These calm waters are ideal for mating and giving birth, and offer plenty of protection to females and their young. Designated as a marine sanctuary, the Silver Bank is one of the only places on earth where snorkelers can enter the water and swim with the whales. 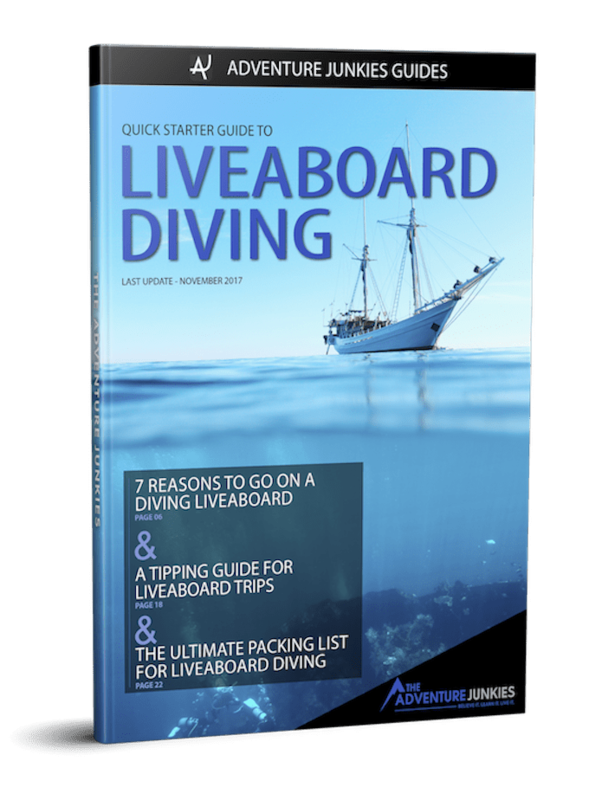 But, liveaboard trips during these months are not for diving. Due to park regulations, only surface interactions are allowed with the whales. What does that mean for planning your trip? 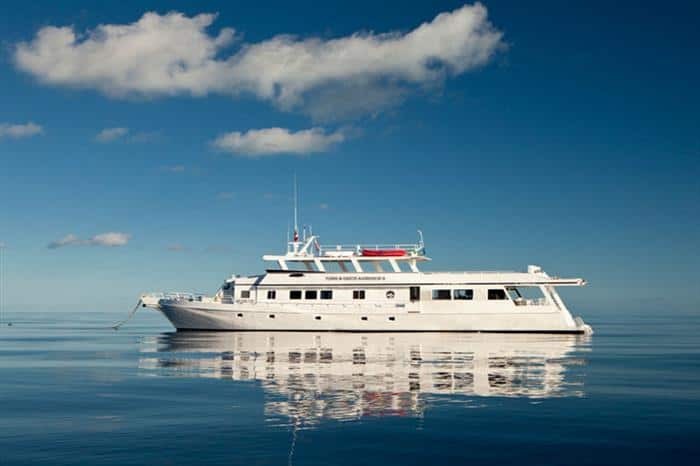 Though both sound incredible, you will have to choose between a strictly snorkeling whale safari and a dive-focused liveaboard holiday. Come May; the calves are strong enough to make their way back up to their cooler North American territory. Local liveaboards resume their scuba itineraries, and the region moves into its shoulder season. With warm tropical water and gentle currents, Turks and Caicos makes a great destination for beginner divers. 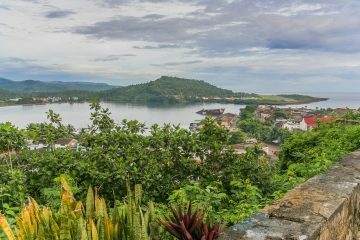 But, those looking to take their trip to the next level can still find plenty of adventure. Sheer walls and deep dropoffs, suitable for advanced open water divers, are a regional highlight. Dive sites around Northwest Point begin shallow but quickly plunge to thousands of feet. Black coral, giant sponges, and large schools of fish out in the blue are frequently spotted, and make these some of the area’s most popular places to dive. The dive sites situated around the uninhabited island of West Caicos are remote, seldom visited, and ideal for underwater photographers. Frequent pelagic sightings include reef sharks, eagle rays, and sea turtles. Above water, the area is excellent for bird watching. You might even glimpse a wild flamingo or osprey passing overhead. The super deep waters around Salt Cay and French Cay attract a variety of large species. Schooling nurse sharks, manta rays, and the occasional hammerhead make an appearance, and large shoals of jacks and grunts are common. During winter months, migrating whales frequent the waters around Salt Cay, and can occasionally be seen out of season as well. These sites are also excellent for night dives, as many bio luminescent organisms make their way up from the depths. 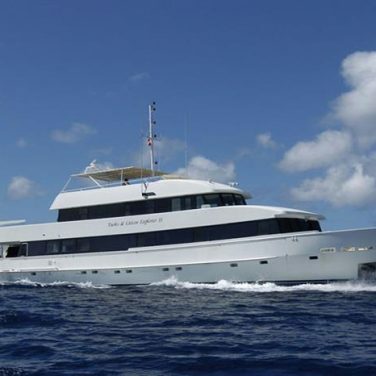 Both liveaboard options operating in Turks and Caicos offer continuing education for divers. Specialty courses include Nitrox, underwater photography, night diver, and more. 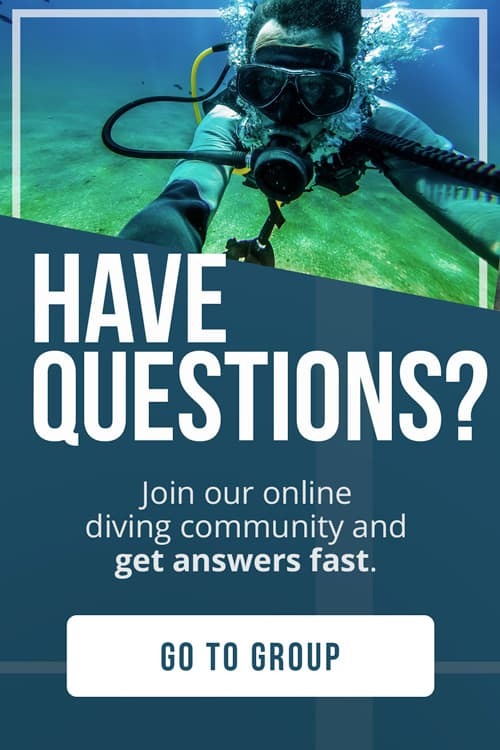 If you would rather try a little bit of everything, the advanced open water course might be right for you, with five specialty dives included. 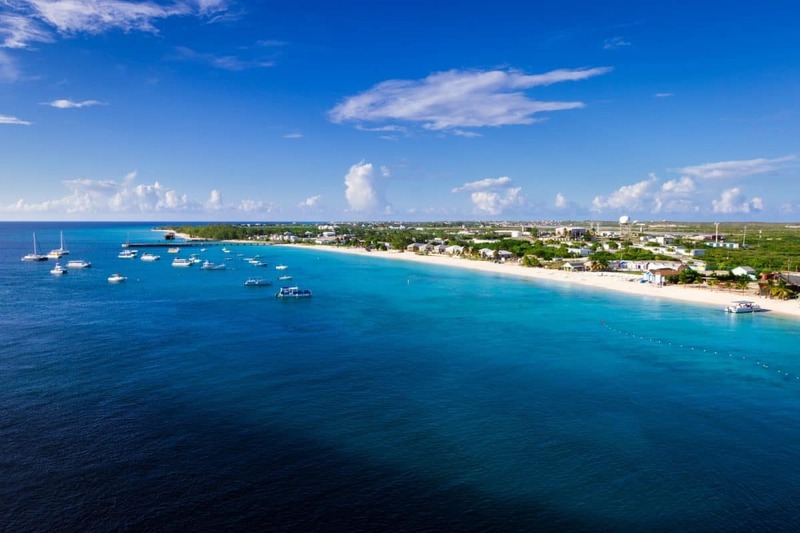 Getting to and from Turks and Caicos is a breeze, with daily flights from several US cities. American tourists don’t need a visa for short visits, and there is no entrance or exit fee. The islands are safe to visit, with low crime rates and a high quality of life. When packing for your trip, consider the climate and activities other than diving that you have planned. Because Turks and Caicos is a modern and developed destination, most American products are available for sale. However, due to import fees, common items may be quite expensive. Do not rely on buying toiletries, clothing or dive equipment upon arrival unless you are willing to pay a hefty markup. 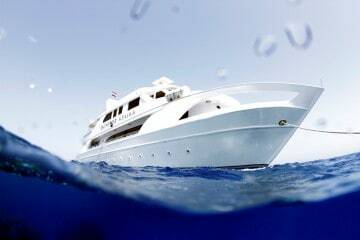 Liveaboard passengers should always carry travel and dive insurance, in case of emergency. Always follow safe diving practices, and dive within your limits. If you are still new to scuba, check out our awesome tips for beginners to make the most of your time underwater. Like much of the Caribbean, Turks and Caicos is not a budget destination. The official currency is the US dollar and prices are comparable to resort destinations within the United States. Plan to spend between $100 and $200 a day for food, lodging and transportation while on land. Additionally, dining and entertainment can be expensive. Tipping is customary in restaurants and taxis, and on your liveaboard, provided the service was good. Of course, it is always possible to pinch pennies. Budget travelers can make their dollar go further by eating in local restaurants, sharing accommodations and visiting outside of the peak tourist season.